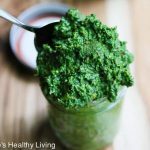 This deliciously healthy Kale Basil Mint Parsley Pesto is great on sandwiches, quesadillas, and pizzas, or tossed with pasta (hot or cold). 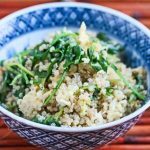 Versatile and nutritious, I use it on everything I can think of during the summer. For the past three summers, I’ve purchased a CSA (Community Supported Agriculture) share, which means I get a box of fresh produce from a local farm each week. I never know what vegetables I’m going to get or how much because it’s based on the yield from the farm. It’s like getting a surprise present every week. 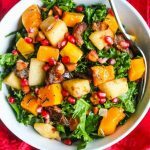 The one complaint I often hear about belonging to a CSA is that you can end up with hoards of vegetables you either don’t like or don’t know how to use, such as kale, Swiss chard, radishes or turnips. I have to say my least favorite vegetables are probably radishes and turnips. There are just so many of those that I can eat since the kids don’t like them. 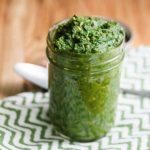 I get lots of leafy greens in my CSA Box, and my go-to recipe for using these up along with fresh herbs throughout the summer is pesto. 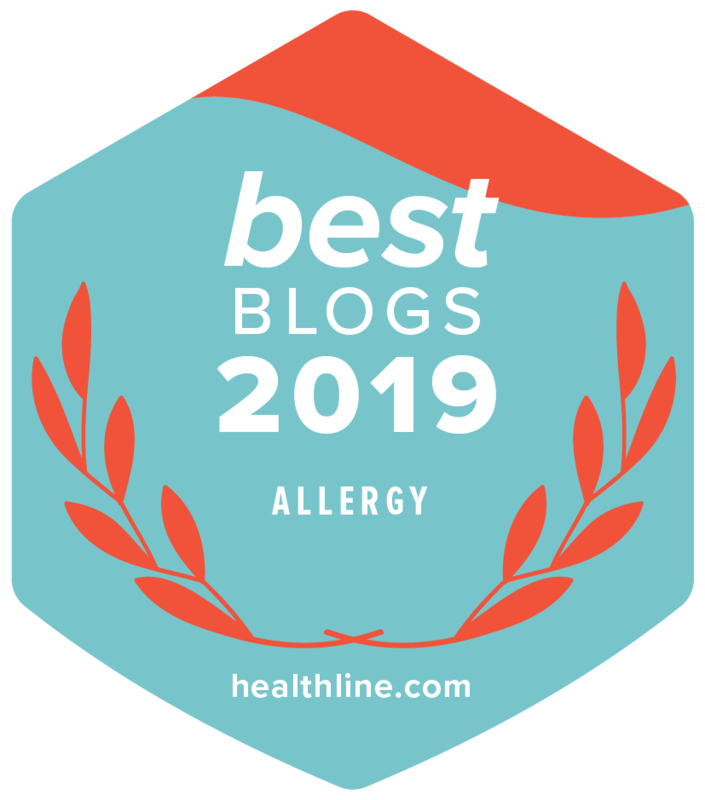 I’ve made pesto with a variety of leafy greens, including spinach, Swiss chard, kale and beet greens, and love the fact that I can sneak these nutritious leafy green vegetables into so many different foods for my kids. They’re not fond of kale, but I’ve found when I mix it in with pesto, they can’t even tell. This pesto was born the other day when I was going through all the produce I needed to use up before my next CSA Box pickup – kale, basil, mint, and parsley. 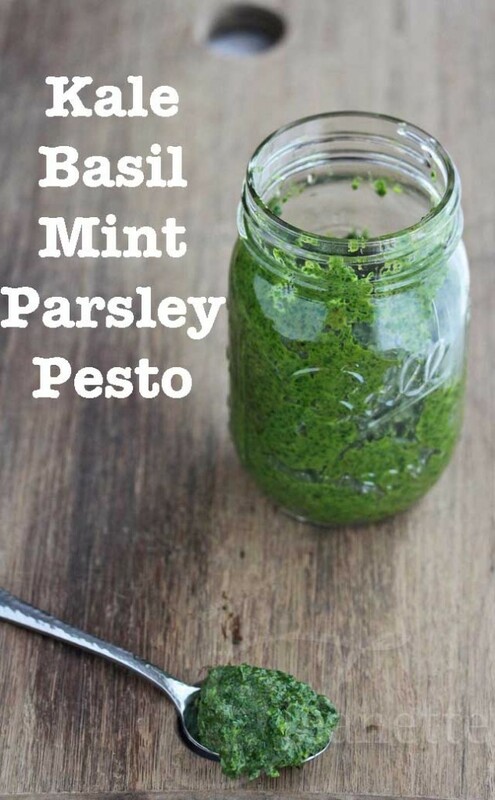 Virtually any herbs are good in pesto – I’ve used cilantro before too. The other day, I made a Cool Asian Noodle Salad using this pesto and a soy sesame dressing (recipe to come). It was a nice twist to the typical pesto pasta salad. And, just this past weekend, I simply tossed some hot pasta with this Kale Basil Mint Parsley Pesto, along with some chopped Heirloom tomatoes and Romano cheese. The boys loved it! Pesto can be made with almost any leafy green, such as Swiss chard, beet greens or spinach. For heartier greens, I like to blanch them first. Bring large pot of water to boil; add kale leaves and blanch until just wilted, about 30-45 seconds. Immediately drain and rinse with cold water; squeeze dry. 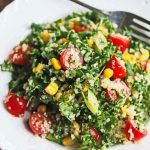 Place kale, basil, parsley, mint, and garlic in food processor; process until almost smooth; gradually add olive oil and process until smooth. Season with salt and pepper. « Jeanette’s Healthy Living Turns Three Years Old and a Happy 4th of July! I love to mix herbs and vegetables in pesto, too. As long as there is one dominant flavor, you can “sneak” in a few others! I make a lot of cold soba noodle salads in the summer, and the pesto works well as a dressing. Lydia – isn’t pesto the best foil? We have pesto in our fridge all through the summer, made with whatever I get in my CSA Box. Hope you’re having a restful summer. I want this for my zucchini pasta! Love pesto, but haven’t tried one with kale yet..
Angie – I love the idea of using pesto on zucchini pasta. I have to dig out my spiral slicer and give it try. Hope you have a chance to try making pesto with kale – it’s so good for you. 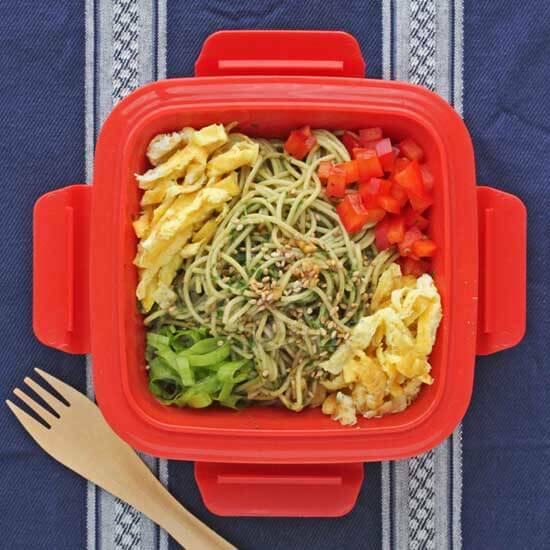 Alyssa – I’ve been having fun mixing in all different herbs in pesto. So funny, couldn’t remember where that red container came from :). What a fabulous pesto! It looks so vibrant and flavorful. Lovely recipe, Jeanette! Thanks Georgia – been sneaking this into my boys’ meals anywhere I can ;). Would love to have the pick of your garden herbs Kelly! My boys love pesto so I try to squeeze in as many veggies as I can into the pesto during the summer when I get so many greens in my CSA Box. 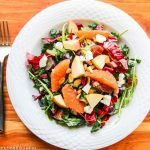 Recipe sounds great and I certainly plan on making it but my question is about the CSA box. Can you let me know how to go about getting one as well? I think it would be great to receive a box of veg every week!! It’s fun getting a box of vegetables each week that are in season – definitely has made me try vegetables I might not have bought otherwise, and expanding our vegetable repertoire. All the produce in my fridge and garden I’ve been wondering what to do with: kale, mint, basil. Seriously, this is perfect! Wow! That’s really a great idea right there! My wife is kind of out of ideas on how to make kids eat greens and vegetables and this pesto is worth the try. Thank you for this! There are a lot of benefits kids can get from eating green and leafy vegetables. The best thing they can have is iron. The greener the vegetable, the higher the iron content. Iron prevents anemia in kids and it generally helps in developing the brain cells. Most kids who have a hard time in school may have low iron. So, it is highly suggested that they get enough supply of iron daily from the food that they eat. 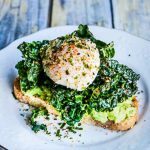 Thanks Adam – this is one of the best tricks I’ve found so far to get my kids to eat kale and other leafy green vegetables! 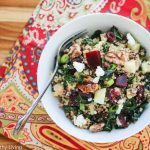 Hi Jeanette – Great Recipe cant wait to give it a try! Just wondering how long it would keep in the fridge for? Thanks! Hi Natashya, this should keep for a week in the fridge. I toss it in pasta, use it as a spread on sandwiches in place of mayonnaise, and in quesadillas. I have been enlightened. I had no idea you could make pesto without nuts!! This makes it so much less expensive, but healthy nonetheless. What a great way to use those huge extra kale leaves I have in the garden. 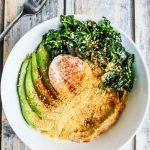 My husband doesn’t prefer to eat it and I have been meaning to look for additional recipes for kale besides salad. This is going to happen very soon at my house. I wonder if it freezes just as well as other basil pesto? Thank you for sharing. 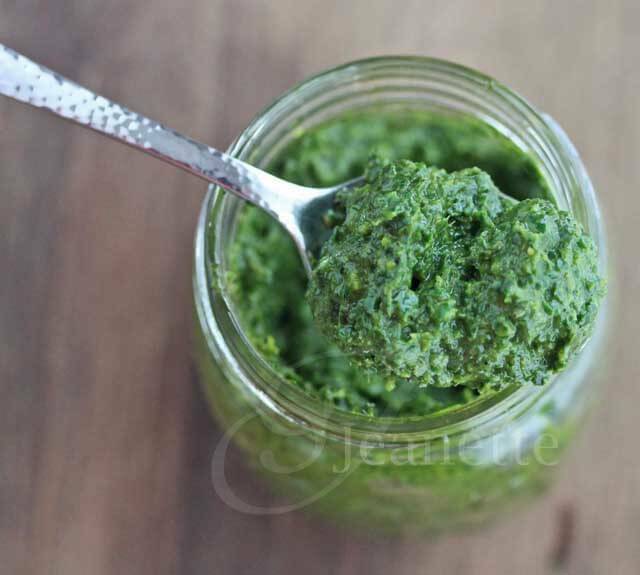 Jolene, hope you like this kale pesto. 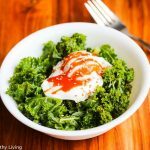 It’s the best way I’ve found to get my kids to eat kale. I haven’t tried freezing it yet, but I think it should freeze fine. You might want to try freezing just a small portion first and seeing how it is. Patricia – add olive oil to cover the surface of the pesto – that should help keep it from turning brown.